Slay: May attack again this turn. Child of Hircine is an epic Strength creature card. It is part of the Core Set. 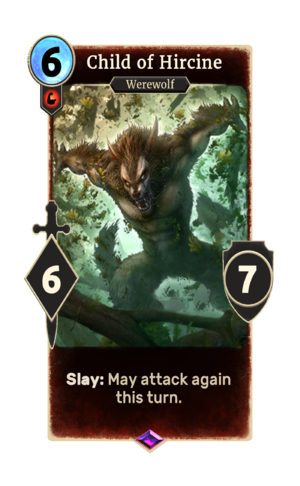 This card was previously part of the training mechanic where it could be upgraded from Initiate of Hircine at level 38. The card is named for the Daedric Prince Hircine, known as the "Father of Manbeasts". This page was last modified on 14 February 2019, at 11:42.